Appealing and refined ambience where the charme of history combines with design and modern comfort. Castello di Velona - SPA Resort & Winery features 46 rooms total: 27 in the historical part of the building (these are the rooms named as “Castle”) and 19 in the new SPA wing of the property (identify as SPA rooms). 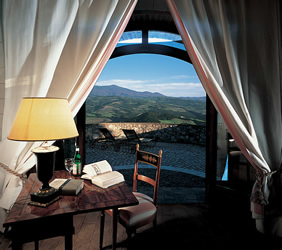 All the 46 rooms and suites are elegantly furnished with antique furniture, selected fabrics and fine materials. The style of the “Castle” rooms is warm and embracing with oak-beamed, vaulted roofs, cotto floors and wide decorative fireplaces. In every room handcrafted decorations and paintings match their colors with the warm hue of the fabrics and the furniture. The 19 new SPA rooms and suites are characterized by a linear and contemporary design and by the presence of fine materials such as travertine and corian. The comfort of these luxurious units is guaranteed by the wide bathrooms (where the tub can be filled with the mineral water hot springs) and by the outside patio where guests can enjoy their privacy and the emotional sunset in the evening.